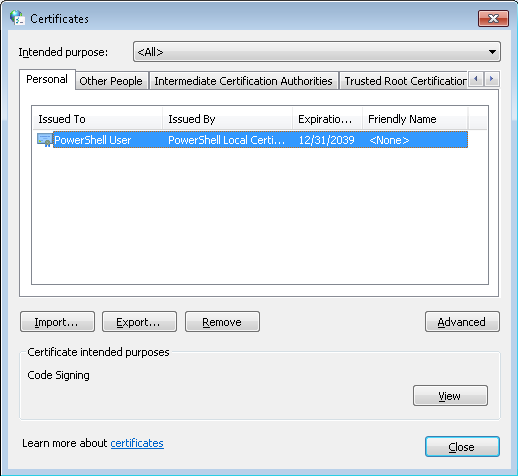 Set-ExecuttionPolicy AllSigned I went to find how to make a certificate for PowerShell. After finding this article I thought I had it in the bag. Well, I didn’t. After downloading that, being the tester that I am, I installed it on a virtual machine. When I went to run it, I got an error that I needed .NET 4.0, so I went out and downloaded that and installed it. Once that was installed I figured I would give the ‘makecert’ command another shot. Wrong again. Since I was worried I would forget where the Software Development Kit would save, I copied the location during the installation. Which is: “C:\Program Files\Microsoft SDKs\Windows\v7.1\Bin” and there it was! Execute the script once you have done this and you will get the options to: ‘Never Run’ ‘Do not run’ ‘Run once’ ‘Always run’ ‘Help’. By selecting A (Always Run) the script will run from then on. Once the script is tested I exported the Certificate. Select ‘Export’ and ‘Next’. On the following menu I selected ‘Yes, export the private key’ and then ‘Next’. After that I selected the ‘Personal Information Exchange – PKCS #12(.PFX)’ and the sub options of ‘Include all certificates in the certification path if possible’ and ‘Export all extended properties’ and selected ‘Next’ Then inserted the password that I created earlier. Once that was done, I selected the path, and saved the certificate. and ran the script. Everything worked as planned. Once the server turned back on (since the script is to restart the server) I simply clicked on the script and the machine restarted again. 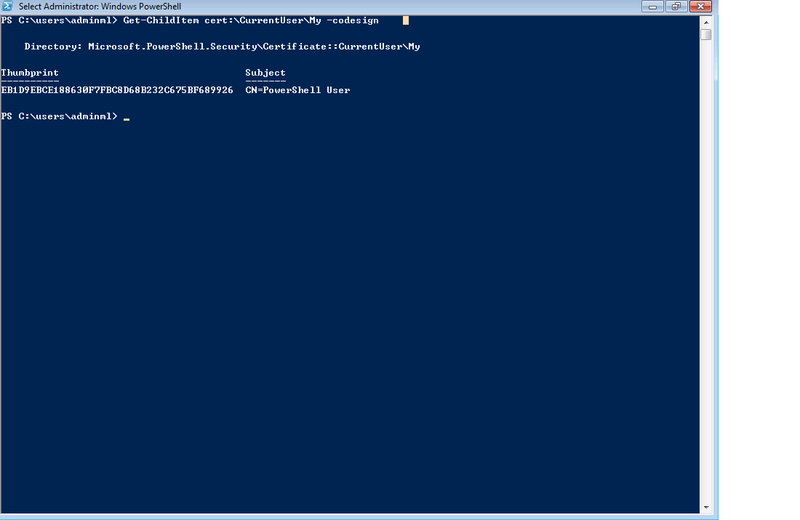 Now I have added the script to my CA, and I did this by opening mmc.exe and adding the certificate option. Make sure that all of the subfolders read “CertSvc\…” so that you know you are on the certificate portion. The certificate was then imported into the ‘CertSvc\Personal’, ‘CertSvc\Trusted Root Certification Authorities’ and ‘CertSvc\Trusted Publishers’.